One of the most fun parts of discovering you are pregnant is letting everyone know. The very first person you want to tell may be your significant other who will be working with you to share the miracle and raise your child. Instead of simply telling him, many women search the internet for "how to tell your husband you're pregnant" creatively. This can turn a simple conversation into a moment to remember and honor the milestone in your life. Use your creativity as a guide when you try to figure out the most surprise ways to tell your husband you're pregnant. The following are some unique ideas that will make it a moment to remember, but you can also change them around or personalize them. Men traditionally propose marriage, so pregnancy is your chance to do a proposal. Create a romantic evening and ask him "will you be a father?" You can also give him the pregnancy test kit in a small box. Suggest that you guys have Chinese food for dinner. Instead of giving him the standard fortune cookie, you can customize a cookie and put this exciting message in it. For example, you can write "I announce you are a dad now!" Besides, there are plenty of candies that you can customize, however you want. Consider getting M&Ms (or another candy) printed with a relevant phrase like "Pregnant" or "Baby Makes 3". Find your favorite pictures of you and your husband throughout your relationship and make a video or slideshow with them. At the end, include a message letting him know you are pregnant. Best of all, you can share the video with others and keep it forever. A good suggestion on how to tell your husband you're pregnant is to play with words. Take the phrase "bun in the oven" and make some cinnamon buns. They can be prepared and refrigerated ones, but make sure your husband smells the great scent and then guide him to find about the other bun in the oven. What's more, if you and your husband love dessert, consider getting a cake or giant cookie decorated with the phrase "I’m pregnant." If you guys already have a pet, let them help you out. Write a note saying you are pregnant or "Mom's pregnant" and attach it to your dog's or cat's collar. Your husband will see it when your pet greets him. For those who are pregnant and already have a child, consider getting your kid in on the surprise. One option is to make a shirt for your child, saying he or she will be a big brother or sister. As a bonus, you can reuse this shirt for official pregnancy announcement photos. Besides, depending on how old your child is, ask them to give your husband the pregnancy test kit and say "baby" or something similar. Prego is a popular sauce brand and the perfect pun to announce a pregnancy. You can get creative or change the label on the sauce jar to say something about you being "Prego". There is another great pun for you. Get a bowl of Sugar Babies for dessert after a meal and hold it right in front of your stomach to make your big announcement. This is definitely one of the best answers to how to tell your husband you're pregnant. When you find out you are pregnant, your baby will most likely be about the size of a pea. Try handing your husband a pea and telling him how amazing that his baby is that size at the moment. Consider making a puzzle that announces your pregnancy to your husband. You can find blank puzzles to decorate at the arts and crafts store. If you like playing Scrabble or Bananagrams as a couple, spell out the message during a game. Or simply set up the game with the words spelled out. Tell your husband that you did something expensive (either by yourself or together). When you get ready to sit down and do some budgeting, hand him the pregnancy test kit instead of a pen. Father's Day cards aren't only an option on Father's Day. If you are trying to get pregnant, buy one and stash it somewhere. Give it to your husband when you find out you are pregnant, signing it from you and your baby. Making your own coupons is always a great gift idea, including for a pregnancy. Make your husband a coupon that says "Redeemable for one baby on [the due date]." 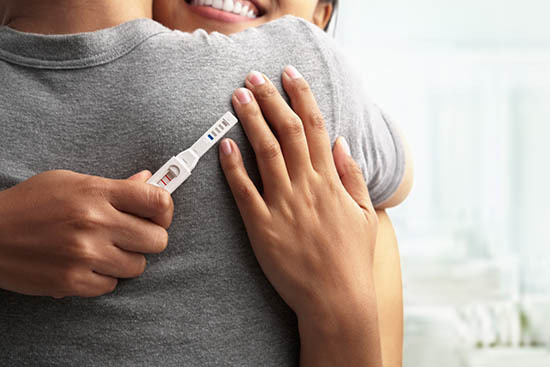 If you are taking a pregnancy test, it is likely that you have been feeling under the weather lately. Pretend you just used a thermometer to take your temperature, and then tell your husband that you can't read it. Pass it to him and ask what it says. Buy the first book for your baby and write a note on the inside for your husband. The message should say something like "Please read this to us 9 months later." This is a good and classic solution to how to tell your husband you're pregnant –have a baby-themed meal. Pick baby carrots, baby potatoes and any other food items you can think of with the word "baby" in them. Take advantage of the new trend of expectant mother parking. Insist on driving the car when you go to a mall or somewhere else with designated spots for pregnant women and park the car there.